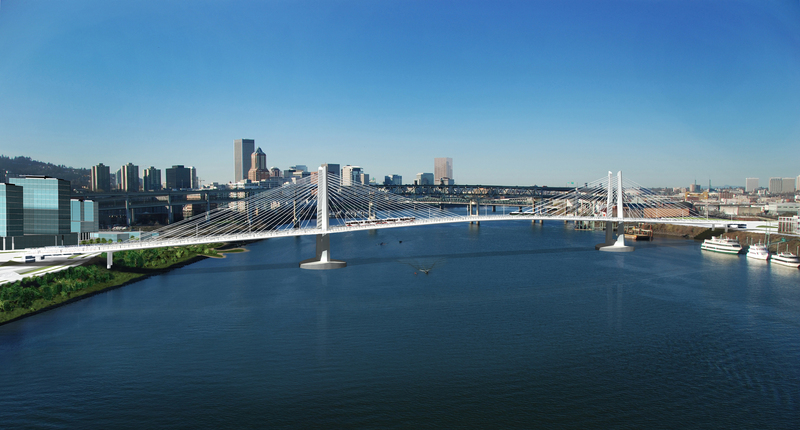 TriMet is adding navigational and aesthetic lighting to the Tilikum Crossing, Bridge of the People. For river users, navigational lighting is being installed that will mark the channel with lights at three points on the bridge deck. Lights are also being placed on the in-water pier caps at the base of the tower pylons. Navigational and aesthetic lighting is being added to the Tilikum Crossing. Aesthetic lighting is being installed on the bridge as part of the Portland-Milwaukie Light Rail Transit Project’s Public Art Program. After installation is complete in September, the lights will be tested over a few days in late September and early October. The aesthetic lighting will be directed at the 20 bridge cables, the four tower pylons above and below the deck, and the two landside abutments. The lighting translates the natural conditions of the Willamette River into subtle color and motion effects. Based on data streamed from a U.S. Geological Service monitor, the lighting will change seasonally and throughout the day in relation to river speed, river height and water temperature. Once the aesthetic lighting installation and testing is complete, it will be turned off until September 2015. The 1.5 percent for art program covers only the portion of the construction that directly benefits the public, and totals $3 million for the entire project. The aviation beacons on top of the two bridge towers will flash red 24/7 to enhance safety near the bridge, as there is regular helicopter and plane traffic near the bridge. As construction of the four pylons that make up the two bridge towers was completed, TriMet installed one light at the top of each pylon that initially flashed white 24/7 as directed by the Aircraft Avoidance Beacon requirements from the Federal Aviation Administration (FAA) but were then switched to white during the day and red at night per further FAA guidance. In the interim, the FAA allowed TriMet to halt the daytime white flashing beacon and keep the red beacons flashing 24/7. In a July 2014 letter, the FAA made a Determination of No Hazard regarding the height of TriMet’s Tilikum Crossing towers, stating that the structure does not exceed obstruction standards and is not a hazard to air navigation. TriMet then evaluated its options and has elected to continue to operate red flashing lights on the structure 24/7 as a safety measure. The unique multi-modal bridge is the first in the U.S. to carry MAX and streetcar trains, buses, bicyclists and pedestrians but no private vehicles. The bridge is the first to be built over the Willamette River in Portland in more than 40 years, extending 1,720 feet (.326 miles) over the river. The alignment is SW Porter Street on the west side and SE Sherman Street on the east side. Emergency vehicles will be able to access the bridge as necessary. 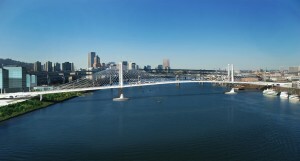 The cable-stayed bridge includes two 14-foot-wide multi-use paths—one on the north side and one on the south—the widest multi-use paths on any bridge in Portland. The first of its kind multi-modal bridge in the U.S. will carry light rail and streetcar trains, buses, bicyclists and pedestrians, but no private vehicles.